This bike is all about economy. It was cheap to build, has minimal environmental impact, and it's easy to ride and maintain. Starting point was the 'take it or leave it' section at our local recycle department. This is a wonderful place: a drop-off point for used or unused stuff, all free to anyone who has a use for it. 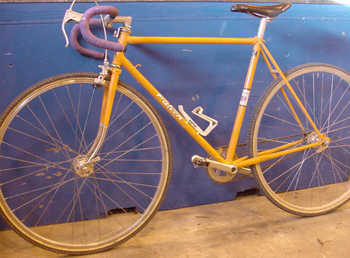 A co-worker picked up a mid-70s Falcon frame, but rejected it after spotting a bent derailer hanger. I checked the 'Reynolds 531' sticker and the lovely head badge and adopted it as the basis for my own fixed gear experiment. I started off with a set of cheapo 27" wheels, also from the recycle department, later traded in for another set with aluminum rims and QR hubs. Then I picked up a set of Shimano M400 cranks off a wrecked mountain bike. They came with Biopace rings and a stripped pedal thread. I machined a threaded insert, and made up a series of chainrings to try: 40t, 38 and 37. All of them worked OK, but I needed something smaller for offroading, so I recut the 38t Biopace ring down to 35t. My rear cog is 17t, and is truly fixed! I built an adapter to use a nice cog from an old freewheel, 1.725" diameter thread down to 1.375" thread. It worked well at first but came loose under braking pressure, so I cleaned up the threads and re-installed with high strength Loctite. I think it's on forever. The stem and front brake came off other wrecked bikes, as did the handlebars. Note the funky curves! I think they're called "randonneur bars". Bar tape was recycled from my road race bike, the one that got wrecked when I was hit by a car. I had to cut off a few inches where it was really cut up. 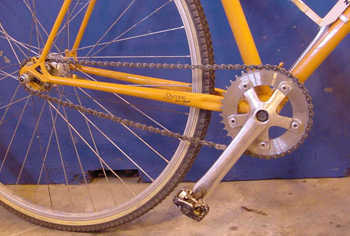 Real cheapskates might want to take note of my technique for reanimating a dead bottom bracket. Pitted bearing surfaces? No problem! Build it up with lapping compound in place of grease, grit your teeth and ride. Readjust as it wears in. After a week, clean it out and build it up properly with a fresh set of bearings. Mine rides smoother than most! My only purchases were a new seat, seatpost, tires and tubes. I found a great deal on a Bontrager seat and decent no-name post at a mail-order outfit. My local Mountain Equipment Co-op had good 'cross tires in 27 X 1.3/8" size that work well for my gravel road rides. The ride is nice and smooth, due to the long wheelbase and relaxed angles. Something is out of true, perhaps the fork or the rear dropouts, because the front wheel seems offset to the left of the downtube. But that doesn't affect the enjoyment of the ride! The Falcon doesn't see serious use at the moment. (For slippery winter commuting, I prefer my old mountain bike.) But I keep it stashed at work. It goes out for a lunchtime ride nearly every day. James Kenney is a 46 year old road racer and sometime tri- athlete. He lives in a small town just outside of Calgary, in Alberta, Canada. Classic Rendezvous have a good Falcon page.